Recently the Law School’s Intellectual Property and Entrepreneurship Clinic secured a patent for a University of Notre Dame invention that could help physicians detect serious diseases faster and more economically. The event – named “Long vs. Short-term Investors in Corporate Governance” – gathered legal and business scholars to talk about the debate over whether short-term shareholders are a threat to the long-term interests of companies and the effect that short-term shareholders could have on the economy. U.S. Supreme Court Justice Stephen Breyer cited two pieces of Notre Dame Law School Professor Mark P. McKenna’s work last week when he wrote the dissenting opinion in Star Athletica v. Varsity Brands, a case that examined the question of whether artistic features on clothing deserve copyright protection. Leading intellectual property scholars will gather Friday at Notre Dame Law School for a roundtable on various dimensions of the scope of IP rights. 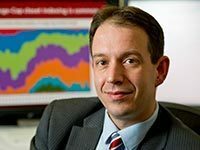 Research by Martijn Cremers suggests that investors should be cautious in how they use Active Share, which became one of the most popular ways to measure the difference between the portfolios’s holdings and their benchmarks. Professor Avishalom Tor will be delivering three lectures at the Catholic University of Louvaine in Belgium on March 15-16. An NDLS Data Security Conference on Friday will focus on the legal and ethical issues in data security. The conference is cosponsored by the John J. Reilly Center and the Notre Dame Office of Digital Learning. Professor Avishalom Tor will present, Some Lessons of Behavioral Antitrust: Theories of Harm, Enforcement Practices, and Competition Law Adjudication, at the European Commission’s Directorate-General for Competition in Brussels, Belgium, in February 2017.